This feels like the right quote to share this week, especially following on from the conversations I’ve had and emails I got after last week’s post. There are so many people in the world keeping themselves small because they are not dreaming big. Depending on our upbringing, we are taught from a young age that dreams are near impossible to achieve or absolutely impossible to achieve. We need to change this within ourselves and for all young people growing up in this world. It is possible to live our dreams. I spent so long not believing I was worthy of having my dreams come true, so I never truly went for them. I was so conditioned that I didn’t even fully notice that I had never properly tried to achieve my goals until this year! I am currently working on my music and preparing to put it forward into the world in a way I’ve never done before. It’s scary! And exciting. And worthwhile. And I feel amazing! I am living my dreams right now- there is no endgame for me- no set idea of what ‘success’ is. Actioning my dream IS success! And that is key. Having goals, having wishes, having ideals, are all really important to the dream process. But so is realising that actioning your dream in any way IS living your dream! It is important to be open and willing to change your goals, to follow the path that is being laid out for you when you know it’s the ‘right’ one, all the while reaching for the stars. I hope you are all continuing to dream and setting your intentions for next year. I am sending you all well wishes that you get all you want and more! 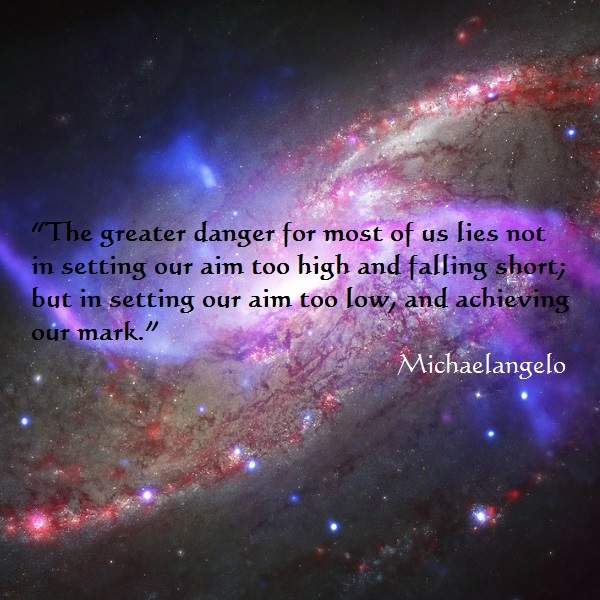 This entry was posted on December 18, 2014 by laura kilty in Inspiration, Thoughts and tagged Achieve, Dream, Dreaming, dreams, Goals, Intention, Michaelangelo, positive living, Possibility, Quote.